Yesterday, I did something I have not done in quite some time, too long, even! I bore my testimony in sacrament meeting. Sitting in the back row, it was a long walk up to the pulpit. Our ward does not use the microphones, so everyone has to go up to the pulpit, although, I usually did anyway. Ok, so I started out with the Dave Ramsey quote above and went from there. From the moment I was done and walked back to my seat (using the hallway vs walking back through the congregation), I have not really been able to remember what I said. I remember thanking a few people in the ward for their examples on adoption and talking about looking back at our lives and acknowledging the people we have met that fit the criteria in the quote above. I remember mentioning that I am a bookworm. Without mentioning any specific books, I noted that I always have a book I'm reading and that I have been blessed to gain something from every book I've read. Maybe that is why I blog all my reviews now, I don't know. I remember thanking the Macedone's for starting and teaching an ASL class. They have such passion for ASL and the deaf community. I have been told that our stake is getting a deaf branch in the near future. So, the timing of this class is GREAT! 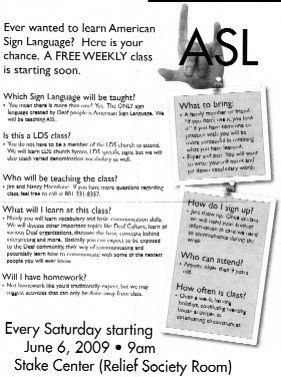 I would encourage everyone to learn ASL. In the flyer below, you will see that this class if for anyone 9 yrs and older. They don't have to be LDS, just understand that there will LDS terminology and hymns taught. I decided to blog about this and include the original flyer for the class, with Jim's permission, of course. I also put it on my google calendar and invited everyone that knows me and especially my husband to come and learn. The next class is on 20 Jun 2009. For more information, contact me, or the Macedone's and we will give you the details. We had a great time at the first class and welcome all that want to come! I also know that I really did bear my testimony. It has been way too long and I am grateful that I took that moment to do this during fast & testimony meeting yesterday! Incidentally, yes, I do know there is no post for yesterday. We are down to one computer and I chose to not get on yesterday, so I didn't post. Also, I'm hoping that maybe it will get me to post early in the day rather than late at night. Your testimony was great- and I thought it was funny that your such a little rebel!! Announcing the class over the pulpit! Jim and I just laughed- I'm happy you guys are going- it's nice to teach people who can actually use it in their everyday life! !